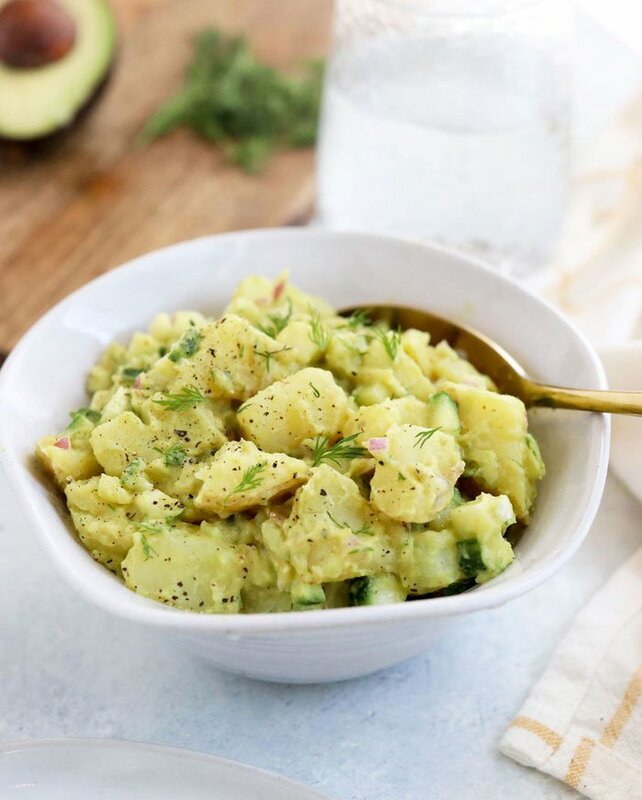 This Vegan Potato Salad is a quick and easy recipe, using creamy avocado instead of mayonnaise. I love how it’s nut-free and oil-free, and that you can’t taste the avocado at all! 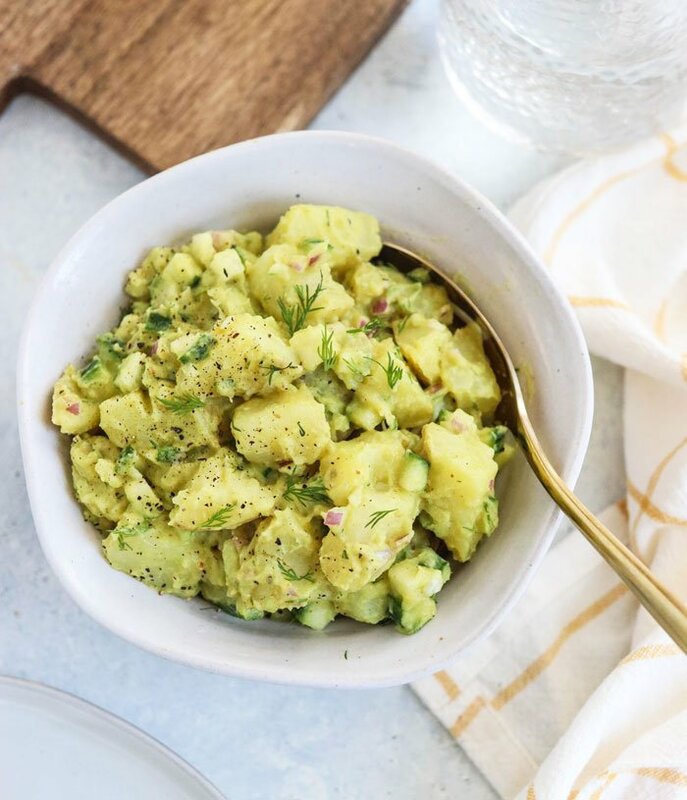 This potato salad gets its creaminess from an unexpected source– avocado! I love using avocado in this case because it keeps the recipe in the starch category for food combining (which may help to reduce bloating) and it means the overall recipe is oil-free. If you aren’t the biggest avocado fan, don’t worry, you can’t taste the avocado once it’s mixed with the rest of the ingredients! 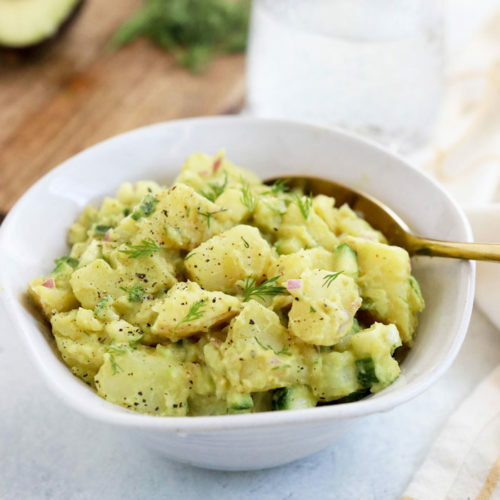 I’m not the biggest avocado lover myself, but I love the flavor of this particular potato salad. 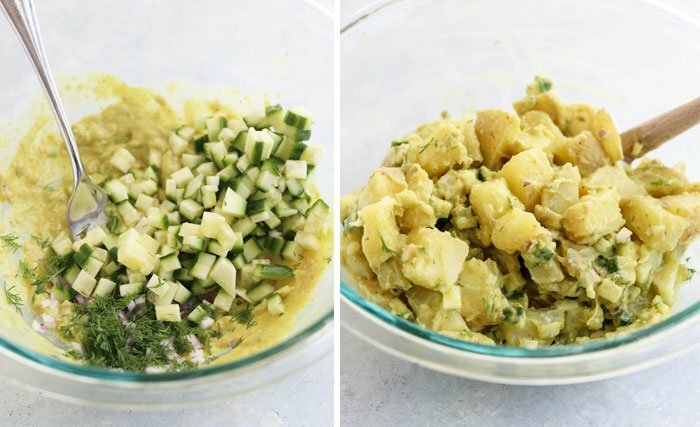 This Vegan Potato Salad has the flavor of traditional potato salad, including fresh dill and mustard, but also has a lower sodium content thanks to the addition of diced fresh cucumbers, instead of using jarred pickles. When allowed to marinate, the cucumbers become quite pickle-like, but feel free to add a few of your favorite pickles if you prefer. Making this salad is as easy as it gets! 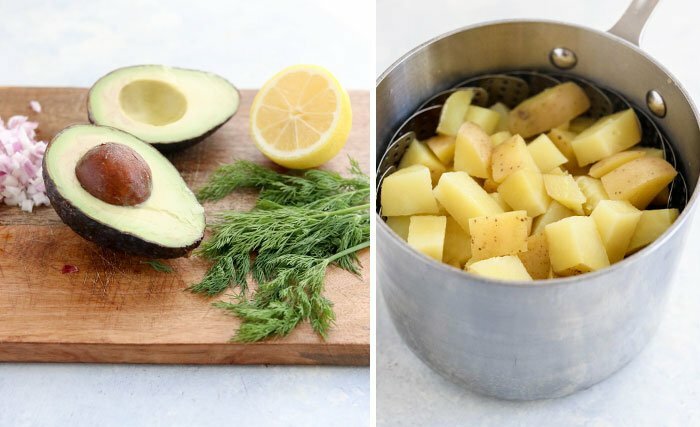 Just cook the potatoes until they are tender, and while they cool you can mash together the avocado “sauce” in a separate bowl and stir in the chopped herbs and veggies. Be sure to taste and adjust the flavors as you go, until it’s just right for you. Keep in mind that this potato salad will have the best flavor when it has the chance to marinate, so I recommend making this at least 2 hours before you plan on serving it. Will the Avocado Sauce Brown? I’ve kept this potato salad in the fridge for at least 3 days in an airtight container, and the potato salad still looks great! You’ll need to stir it again to reincorporate the sauce, but you can definitely make this a day in advance if you’d like to. This recipe can be easily adapted to suit your personal taste, so feel free to get creative! Use yellow mustard if you prefer it over Dijon, and use any other herbs or seasonings that you like. Yukon gold potatoes, red potatoes, or even sweet potatoes can be used in this recipe, depending on your preference– keeping in mind that the sweet variety will change the flavor. As always, if you try something different with this recipe please leave a comment below letting us know how it worked out. We can all benefit from YOUR experience! Reader Feedback: Are you a fan of potato salad? Anything made with mayonnaise used to freak me out as a child, but now I love this stuff! I made this for Easter and it was a huge hit! question? how far in advance can this be made? I want to make this for the fourth…. but want to prepare ahead. does the avacado turn brown??? The avocado does turn brown the next day. So, I would suggest cooking the potatoes and chopping everything ahead of time, and then you can just stir together the sauce before serving so it still looks nice and fresh! I made this and it was SOO yummy!! How delicious! I definitely love that you added dill to this potato salad, it sounds so yummy! Thank you for sharing, absolutely making this the next time I go to the grocery store! I know this recipe was posted years ago but I have just found it. My question to anyone on here, How far in advance can you make this? I ammaking it for several people who can’t tolerate onions. Any good substitute for onions? Has anyone tried this with steamed cauliflower? I just made this after a couple of failed attemptes at making a delicious vegan salad to bring to a Christmas dinner. This one is definitely a winner! I love the flavours. Thanks for the delicious simple recipe! This looks pretty awesome. 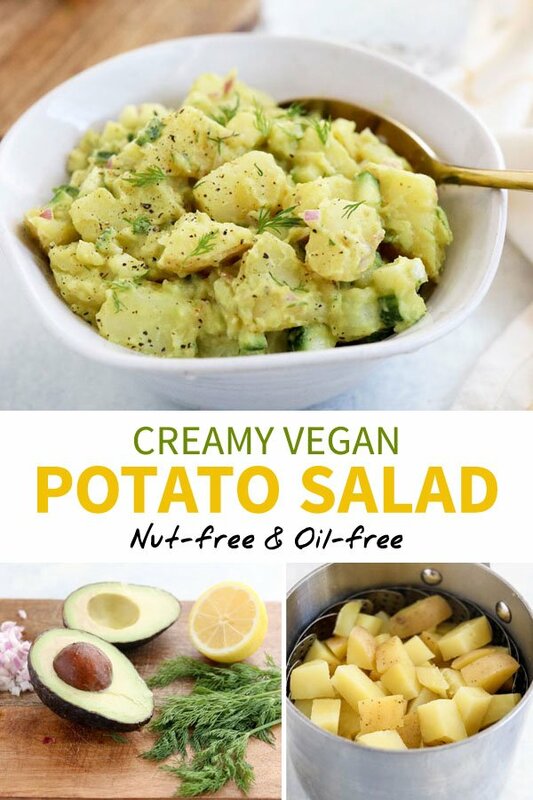 I love potato salad and am not vegan but I really don’t want to eat mayo so this is perfect. Does it turn brown after sitting in the fridge a while, or does the lemon keep that from happening? Just made this recipe for the first time. Followed it exactly, tasted it, and although it is a really good base I thought it was missing something. After adding more salt and being afraid to over salt it I realized that the “something” might be vinegar. Sure enough, I added just 1/2 tbsp of white wine vinegar and voila – it was perfect! The avocado is a great creamy replacement for mayo! This really does look good. Avocado makes everything better! Does the avocado turn brown if made the day before? Yes, it’s not as pretty if it sits in the fridge overnight– but it still tastes good! Good to hear that the potato salad still tastes good after a day, even if brown. Can you estimate how long the potato salad would still taste good, despite the avocado turning brown? I’ve always assumed that the brown color (of the avocado) also meant bad taste (of the avocado). I guess your saying that isn’t true. So now I’m wondering whether the brown avocado also continues tasting good for a few days. Thanks for sharing what looks like a great potato salad recipe! We had this salad at a BBQ last weekend and it was fantastic ! I have a bunch of Dutch Baby potatoes that I think will be perfect for this.